This week, I started "Mommy School" with Little Man. I am having so much fun combining my 2 favorite roles--Mom and teacher! Our theme this week is cars and trucks. 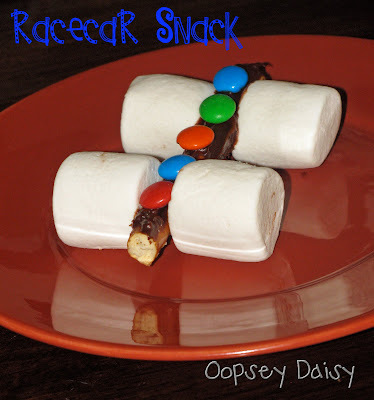 I will share some more details of our learning activities this weekend, but I wanted to share our yummy race car snack! This race car is simply a pretzel rod, covered in frosting, decorated with M&M's (Little Man's favorite! ), with marshmallow wheels. I toyed with mini marshmallows for the wheels, but the big wheels were just so much cooler! I Love the BIG wheels! I am going to try this for my little man this week. thanks for sharing! ah that is such a good idea!! I should try that with the little one I watch!! Very fun! Visuals are the BEST. Especially ones you can eat! I LOVE this!! Totally awesome idea! Hmmmm – I have pretzel rods and marshmallows… and raisins, so those can replace the m&m's. I'll have to make my son one of these tomorrow!